Armed police have been stood down and two central London Underground stations have reopened following reports of gunshots being fired at Oxford Circus. Police want to speak to two men after an altercation "erupted" on a platform at the station, but say there is no evidence any weapons had been fired. Officers also want to speak to anyone who was at the station about the cause of the mass panic and evacuation. Sixteen people were treated after they were injured fleeing the station. 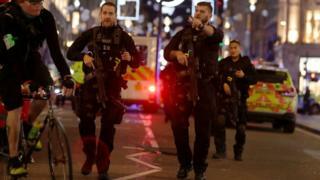 Oxford Circus was closed and armed police were deployed following reports that gunshots had been heard inside the station. Police initially treated the incident as potentially terrorism-related, while nearby Bond Street station was closed amid fears of overcrowding. The British Transport Police (BTP) said officers believe there was an altercation between two men on the platform before the scare. They have released CCTV images of two men they want to speak to. 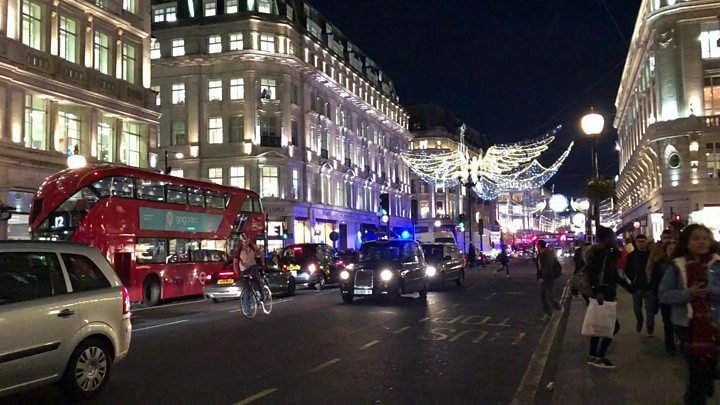 The Met said it began receiving "numerous" 999 calls reporting gunshots in Oxford Street and at Oxford Circus station at 16:38 GMT. Oxford Circus - where Oxford Street and Regent Street meet - was cordoned off, while shops and businesses were placed in lockdown. In a statement, the Met Police said: "Officers working with colleagues from British Transport Police carried out an urgent search of the area. "No causalities, evidence of any shots fired or any suspects were located by police." However, the force said there had been "significant" panic at station. 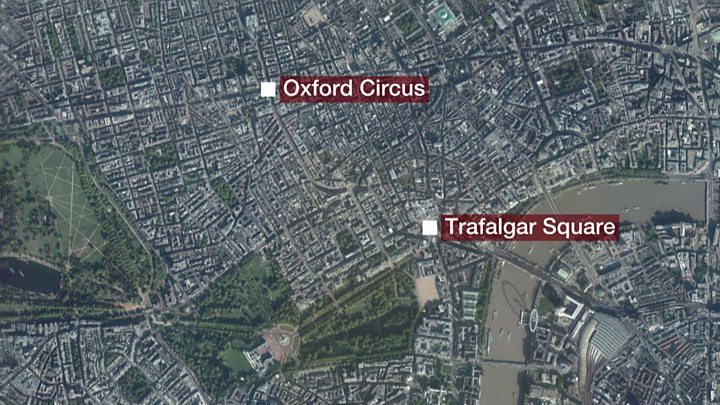 Sixteen people were injured as passengers fled from Oxford Circus station, in what witnesses said was "a stampede". One patient was transferred to a major trauma centre for leg injuries, while eight people were taken to central London hospitals for minor injuries. A further seven patients were treated at the scene, the London Ambulance Service added. Scotland Yard said the operation had been stood down at 18:05 GMT. British Transport Police said it received reports of gunfire on the westbound Central Line platform at Oxford Circus. "This caused a significant level of panic which resulted in numerous calls from members of the public reporting gunfire," the force said. "During the search officers did not find any evidence of gunfire at the station," it added. Image caption Eyewitnesses said it was "a very panicked scene"
Police said additional officers would remain on duty in the West End to reassure the public. In a statement, Mayor of London Sadiq Khan praised the city's emergency services for a "swift response". Meanwhile, the Duke and Duchess of Cambridge have attended the Royal Variety Performance, at the nearby London Palladium theatre. However, their scheduled arrival was delayed by an hour, as a result of the incident. A Kensington Palace spokesman said the royal couple were in time for the start of the show, but the traditional pre-show meeting with some of the performers had to be dropped. The scare happened on Black Friday, at a time when Oxford Street and the surrounding areas were filled with shoppers. BBC reporter Helen Bushby said she had seen a "mass stampede" of people running away from the station in the panic. "They were crying, they were screaming, they were dropping their shopping bags. It was a very panicked scene," she added. "People said they heard a gunshot and panic was just spreading." She spoke to a group of young women at Topshop, in Oxford Street, who said people had dropped their shopping and ran as quickly as they could. Greg Owen, 37, from London, said he was at Oxford Circus station when people began running away. "I was next to the Tube station and everyone started screaming and shouting and then a flood of people came up the stairs," he added.